Coat colors include fawn, fawn and white, brindle and white, white. The American Bull Mastiff (ABM) requires a firm handler, and is very protective. They absolutely love children, and are natural protectors bred for the specific task of livestock / family protection. The ability of this task is necessary to the old days of the true "Band dog." Used to control unruly cattle and swine as well as intruders, the ABM is a holding dog, par force. This breed will be completely submissive with proper training and a handler who has a natural authority over the dog. Proper human to canine communication is necessary. The American Bull Mastiff will do okay in an apartment if it is sufficiently exercised. They are relatively inactive indoors and a small yard will do. A brisk walk twice a day will suffice to keep your ABM in good physical and mental condition. While out on the walk the dog must be made to heel beside or behind the person holding the lead, as in a dog's mind the leader leads the way, and that leader needs to be the human. The American Bull Mastiff will enjoy a brushing daily, but it's not required. Nails will need trimming once a month. Teeth may require a cleaning periodically and should be done by the veterinarian. Flea and tick preventative is recommended as well as heartworm preventative. We recommend that you consult with a qualified veterinarian before cleaning or treating your dog with any products. 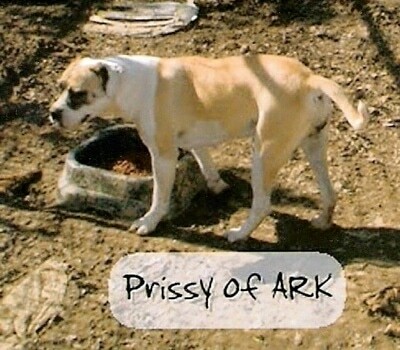 A cross between an Alaunt type German Mastiff, 'Sassin, who shows ribs while free standing at 140 lbs., to both an American Bulldog and a White English Bulldog was made to produce the American Bull Mastiff. The ABM is ONLY registered with the BBC. The ABM is gritty like a bandog, and greatly resembling the Boer Boel of South Africa, which themselves were developed mainly from German and Dutch Alaunt type Bulldogs and Mastiffs. Various Bull and Mastiff breeds were imported into North America from various countries. The first major imports were brought by Spain. 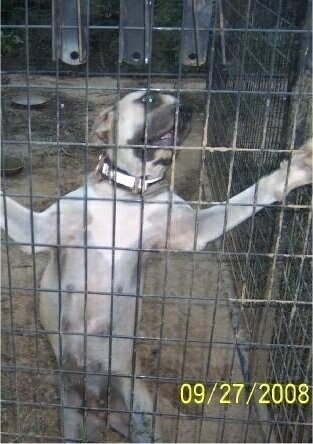 Such dogs have always been used in guarding farms and controlling livestock. Various breed types developed in various locations. The American Bull Mastiff represents one of these variations.